Known as Pfannkuchen in Berlin, Kreppel in Hessen, Krapfen in Southern Germany and Berliner just about everywhere else (excluding various dialectical variations), the jelly-filled donut, the cause of much unintended mirth when John F. Kennedy famously declared 'Ich bin ein Berliner' is a quintessential culinary component of Germany's carnival season.Carnival season, known as Fasching, Karneval or Fastnacht, depending on the region, is celebrated mostly in catholic areas of Germany, yet the ubiquitous donut is a hit wherever you go. 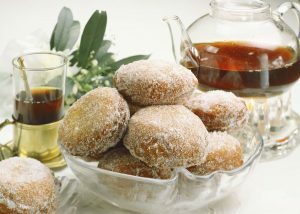 During the carnival season you'll find bakeries on every street corner with their counters piled high with various types of donuts, most filled with jam but also with vanilla cream, chocolate or even egg nog. Heat the oil to 370 degrees F in a deep-fryer or large saucepan. Lower the donuts 2 to 3 at a time into the hot oil and fry until the puff up and turn golden brown.